After a week of that, I finally got sufficiently annoyed to Google the error, as one does. Wow! Perfect! Oh, sweet, there’s a tool to fix the problem! Hey wait a minute – this is not webex.com. And the language on the page is a bit techno-babbly. Bonus points: that language drop-down menu was just added for verisimilitude – it doesn’t actually have any options other than English! In case it wasn’t obvious: don’t download anything from this website. Virustotal.com confirms the obvious: it’s packed with malware. This is a great opportunity to point out that there are people at great software companies who DO make sure that when customers search for error messages, they can find good content which helps them solve problems – instead of falling prey to malware scammers like this. SEO FTW! Tesla Model 3: Seattle to Crystal Mountain and back – can it be done without recharging? I did stop and charge for a couple hours at a Blink station in Maple Valley on the way while we ate lunch at Original Pancake House and shopped for groceries at Fred Meyers. This took about 2:15, cost $4.10, and added 10.5 kWh or 13% battery capacity (aka State of Charge or SoC) — but it turns out I didn’t need the charge to make it round trip. Want more details? Here you go! Depart Seattle, preheated on shore power, SOC95%. Drove to Maple Valley: SOC 80% Usually 5mph over the limit. Cabin set to 68F, but no seat heaters the whole way out. Drove I5 to I405 to WA169. Charged at the Blink station behind Fred Meyers in Maple Valley: SOC 93% Total charge time was about 2:15; ate brunch at Original Pancake House & grocery shopped. Added 10.5kWh for $4.10. Tesla trip navigation estimated Maple Valley to Crystal would leave us at 68% on arrival, and 61% back to start (in Maple Valley). Arrived Crystal: SOC 60%. We kept boards & skis in the Tesla (with one of the rear seats folded down). This meant we’d unlock it at least twice a day, often using the app so I could unlock for my kids if they came back from the slopes at different times than I did, which of course wakes it from sleep. I did make sure the cabin heat didn’t automatically come on each time. Stayed for 3 nights, overnight temps between 14-28F. Day 4 morning: SOC 51%. Preheated cabin while loading in and defrosting, brushing snow off. Also used heated seats + heated cabin to 68 for the whole drive back to Seattle. Arrived Enumclaw: SOC 46% and had lunch at Jackson’s Pizza, which we love. Drove back to Seattle: SOC 28% Once on I5, mostly 70mph. So without the 13% recharge in Maple Valley on the way down, we still would’ve had 15% SOC remaining on the round trip. For our next day trip with no overnight loss to worry about, I probably wouldn’t even charge on the way (unless we wanted breakfast, in which case a combined charge/OPH stop sounds great). And once the Enumclaw supercharger gets built, there won’t be the slightest worry. What I really appreciated about it is that is chock-full of highly practical suggestions that can be readily implemented. It’s also a nice balance of viz authoring advice (much of which will be a refresher if you’ve read Tufte, Few, Yau, Cairo, etc) along with very concrete suggestions for how to present data in a way that can drive action – thinking about the audience, what story you’re telling them, and what you want them to leave with. Showing the steps involved, whether in building / improving a viz, or in telling a story using data, was tremendously helpful to me – showed how to put principles into practice. Brilliantly relevant to our customers. Cole did a skit of a typical boring business presentation of data findings. She then itemized a clear set of storytelling techniques: repetition, pictures, narrative arc (plot, rising action, climax, falling action, ending). She then retold the story. Might have been the best talk of the day. I highly recommend the book to anyone who wants to communicate with data. Aka Italian Fries, as served at the Grill in Macalester College‘s old Student Union (circa 1990s, before the remodel and adding an extra “e” to create the Grille, which seems WAY too healthy to ever serve such a concoction). I got a tip on ingredients list relayed from a friend of a former Grill student worker. Came up with quantities & directions through several (mostly delicious but occasionally ridiculously cheesy) trials. Pour 4oz dressing in middle of pizza, brush out to meet crust/oil band. Feel free to go lighter depending on how “juicy” you liked your i-fries. Bake at 450 until cheese starts to get a little browning – 8-12 minutes. What Mac memories do i-fries bring back for you? Ready to move beyond bullet points for your presentations? Here are some of my favorite places to search for images to use in presentations. Creative Commons search (and as of July 2017, a new CC search is in beta) has pointers and a front end for searching additional resources that support usage rights. Always pay attention to re-use rights and respect the creator’s intent – don’t just take any image you find. If the re-use requires attribution, be a mensch and include the credit in your preso. Just testing phone links in iOS. Twice as many Americans as Germans want self-driving cars. That’s one of the first things I learned from asking the next set of questions. Teslas can all be custom-ordered. Tesla has a great configuration site where you can pick out every detail – if you’re ordering a Model S or X. But so far, we Model 3 reservation holders don’t even have the opportunity to tell Tesla what color we want. At least, not through Tesla’s site. Model3tracker.info to the rescue! This crowd-sourced data lets anyone self-report the options they want to choose for their Model 3. Just register and fill out a survey based off previous official statements, and maybe some rumors and tea-leaf reading, too. 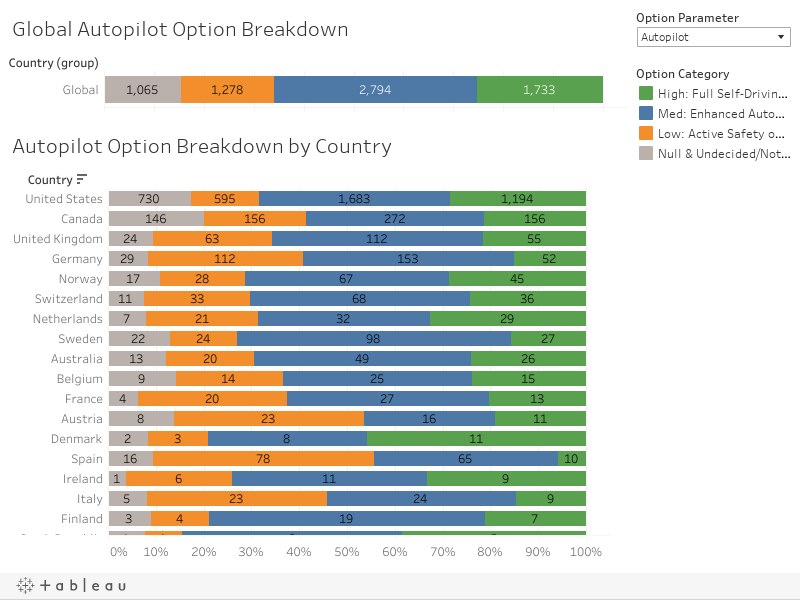 We interrupt this blog post to try out different ways around the problem of embedding Tableau Public vizzes on WordPress. 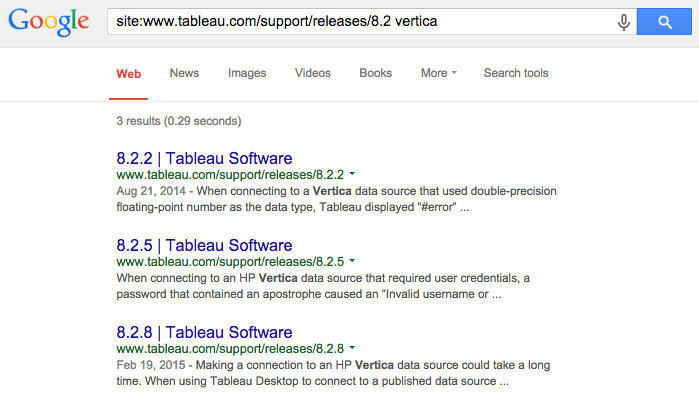 Seeing a couple different suggestions using Tableau’s new support search. Tried using the “logical line breaks” method John Barr described on the Tableau forums.. It did not work, even when I copy/pasted from John’s example. Though clearly it works on his blog. Alright, back to Tesla datavizzing! I plan to come back to this blog post and update it with a few details about how I made this viz, and keep updating it. Already I’ve tried out a few techniques and features I haven’t previously, and learned a thing or two. One thing that works very well for me is reading, especially lessons learned and case studies from practitioners. A book I frequently turn back to is Making Things Happen by Scott Berkun (he was a Microsoft program manager who shipped things like Visual Basic for Excel, and Internet Explorer 4 – the first really good version of IE). It has been a few years since I last read it, I should do a re-read soon. Scott’s blog is also excellent. Over break, I read a book recommended by a coworker: The Membership Economy. This is one of those business books tha t has a few excellent insights which then get spun out to fill a book. Worth checking out from the library and flipping through for an hour or two. Or find a good summary online. It may help crystallize things by providing a shared vocabulary for discussions with my colleagues, but I don’t think it is as insightful (or as data-driven!) as Effortless Experience. I’m currently reading Kathy Sierra’s Badass: Making Users Awesome. I love it so far; it has the great design of Kathy’s Head First books, and I love the message and mindset. Highly recommended. For this year, the topic I’m thinking a lot about is how to work effectively in teams. The book I’m reading now is Beautiful Teams from O’Reilly, with dozens of chapters contributed by a wide range of thinkers and practitioners, from programming gu rus Grady Booch and Scott Ambler to sci-fi writer Cory Doctorow. Another book in my queue is from Bob Lewis, longtime Infoworld columnist (and IT consultant). He has some great, short books like Bare Bones Project Management: What you can’t NOT do. (And a followup on Bare Bones Change Management that is also very helpful for anyone making changes.) The book I’m going to read next is his latest: The Cognitive Enterprise. I haven’t read it yet, so I can’t tell you if I recommend it or not! But now that I’ve told you about it, it’ll motivate me to actually follow through and pick it up off my to-be-read pile – aka tsundoku. 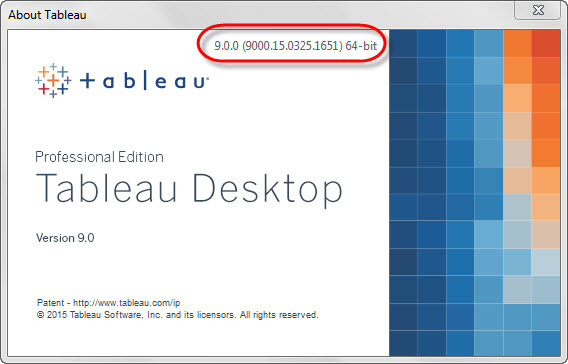 Of course, you can SEE the version and build number of Tableau Desktop from the Help menu, with Help > About. But usually you want to give this information to someone else – for example, pasting it into an email or support case form. You could use your eyeballs and fingers, and transcribe the sixteen digits the old-fashioned way. But I just learned there’s an even easier way to do it. When the “About” dialog is open, just Copy! But in environments with intensive change control requirements, it can be very useful to be able to find specific, relevant reasons for upgrading. 1. How can I find a listing of issues fixed between whatever release I’m currently using vs. the latest maintenance release? 2. How can I find which release had a fix for a specific issue? 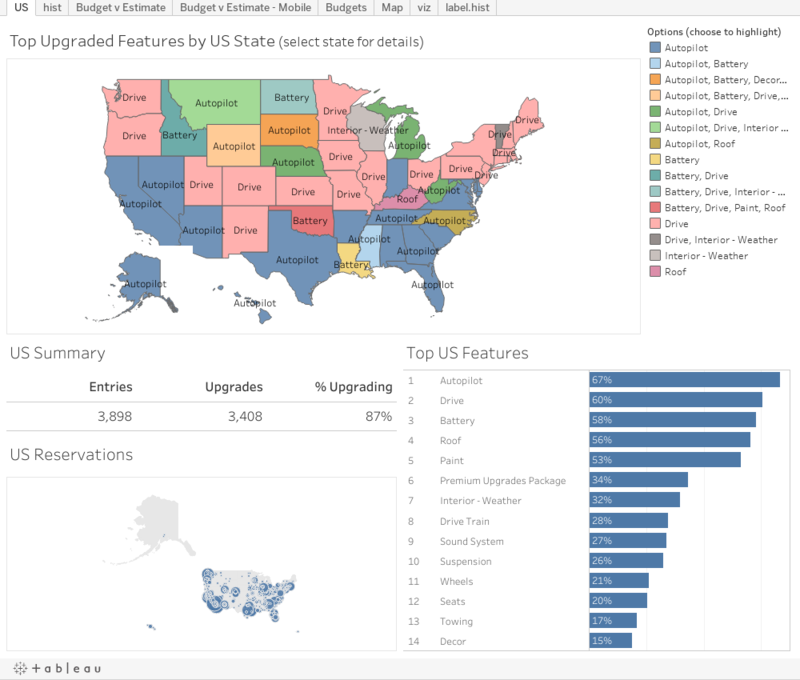 The Tableau support website enables both these scenarios. and so on. They’re now all linked on the releases page, so you can just open them in new tabs manually, or you can write a script to download them. Enjoy! Leave a comment to let me know if you find this tip helpful, or have other use cases for Tableau’s release notes.